Here are some new Panerai straps A101~A109 available, and some custom straps Porder101~Porder125 which have sold by way of some custom strap orders. 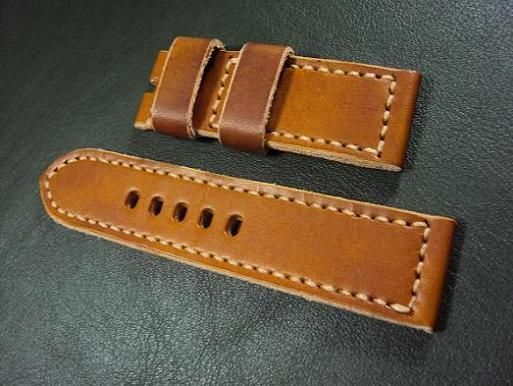 Each my strap sample could be made a new custom strap according to the specification of the custom strap order. 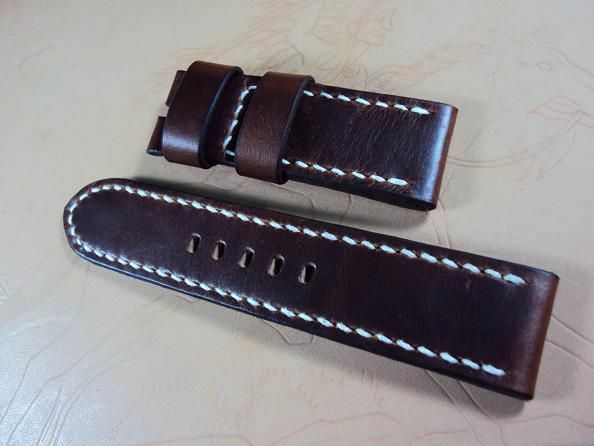 A101, 25x24mm, 75x125mm, thick 4.5mm taper to 2.8mm, dark brown vintage leather strap, white stitch. The thick 4.5mm would bear the heavy watch, and the thick 2.8mm at the tail would be flexible and comfortable. It's priced at $ 120 USD, now charges the promotional price at $ 70 USD including registered airmail worldwide shipping. 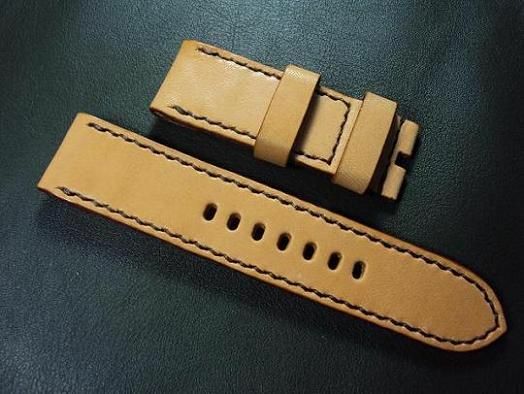 A102, 24x22mm, 80x135mm, thick 6.0mm taper to 4.0mm, tan ultrasoft leather watch strap, black stitching. The thick 6.0mm would bear the heavy watch, and the thick 4.0mm at the tail would be flexible and comfortable. 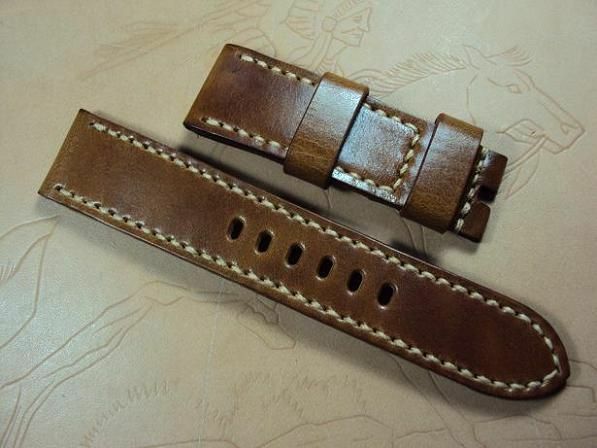 A103 deployant strap, 26x24mm, 75x130mm, thick 4.0mm taper to 2.3mm, coco tan grained leather watch strap, cream stitch. The thick 4.0mm would bear the heavy watch, and the thick 2.3mm at the tail would be flexible and comfortable. 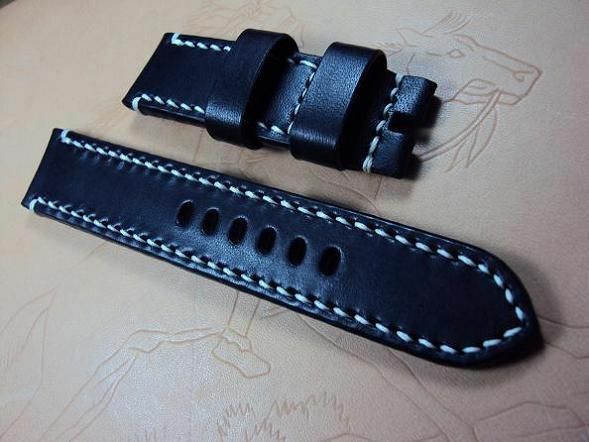 A104, 24x24mm, 80x135mm, thick 6.0mm taper to 5.0mm, black vintage leather strap,white stitching. 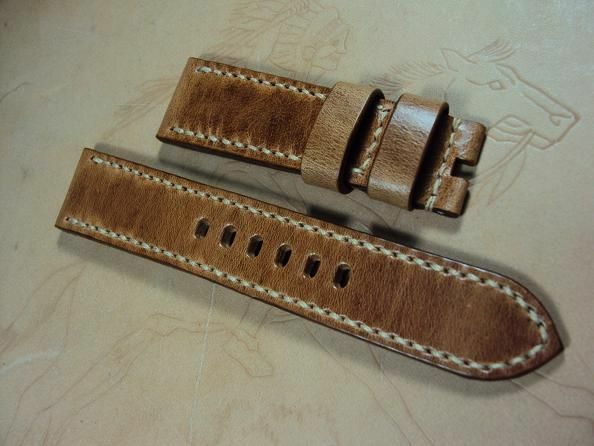 A105, 24x22mm, 75x130mm, thick 4.5mm taper to 3.5mm, brown vintage leather watch strap, cream stitching. 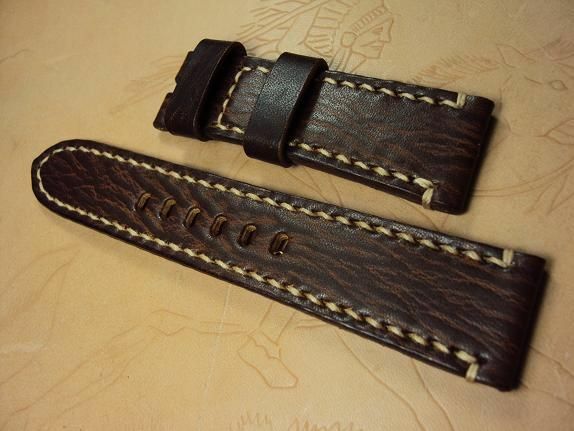 A106, 24.5x22mm, 78x130mm, thick 5.0mm taper to 2.5mm, chocolate brown grained leather watch strap, cream stitching. The thick 5.0mm would bear the heavy watch, and the thick 2.5mm at the tail would be flexible and comfortable. 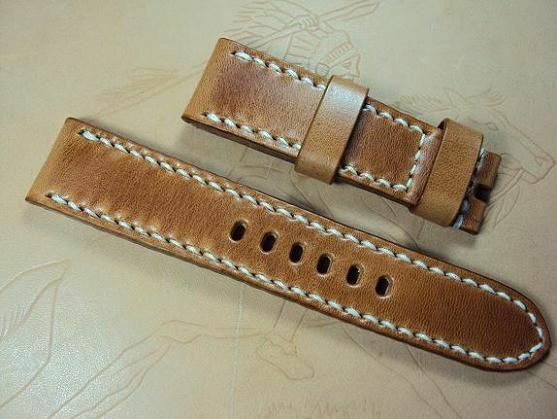 A107, 24x24mm, 80x135mm, thick 6.0mm taper to 3.5mm, tan vintage leather watch strap, white stitching. The thick 6.0mm would bear the heavy watch, and the thick 3.5mm at the tail would be flexible and comfortable. 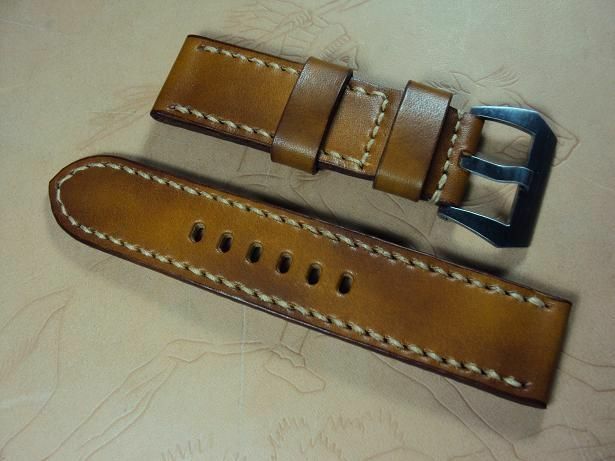 This tan vintage cowskin strap is priced at $ 130 USD, now charges the promotional price at $ 80 USD including registered airmail worldwide shipping. 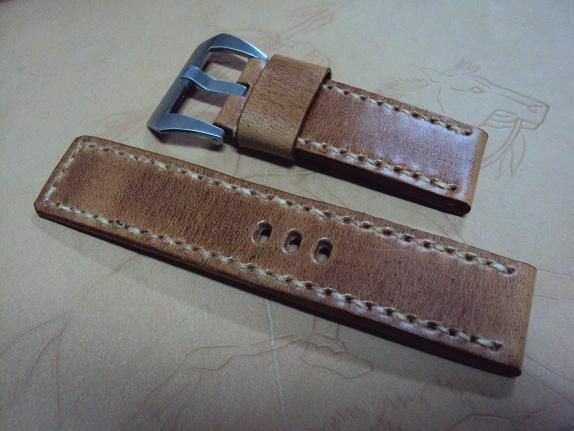 A108,hidden screw strap, 26x26mm, 80x142, thick 4.5mm, tan ultrasoft tan leather strap, dark brown stitch. The hidden screw strap is priced at $ 150 USD, now charges the promotional price at $ 100 USD including registered airmail worldwide shipping. 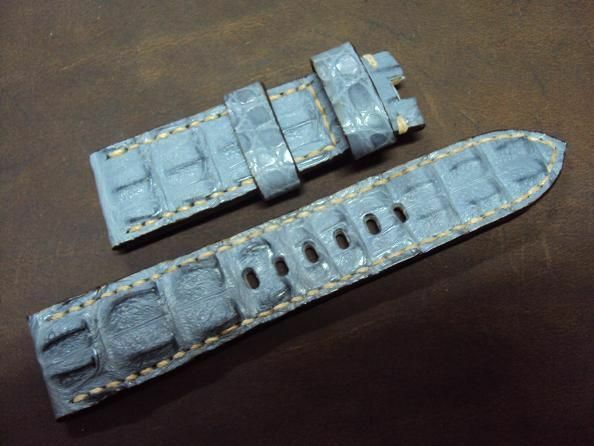 A109, Panerai grayish blue big horn crocodile deployant strap, 24x22mm, 75x130mm, cream stitch. 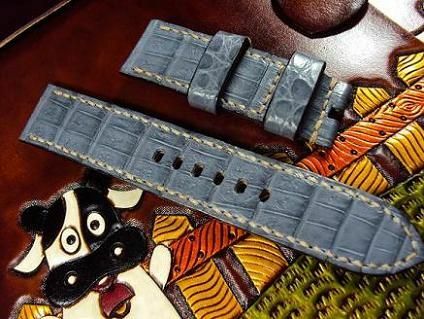 The big horn croco strap is priced at $ 270 USD, now it charges the promotional price at $ 220 USD including registered airmail worldwide shipping. 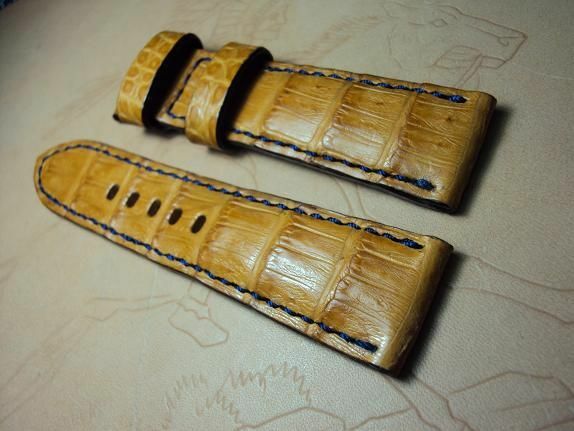 Here are some custom straps Porder101~Porder125 which have sold by way of some custom orders. Each one of my posting straps would be able to order a custom strap in your wrist size. 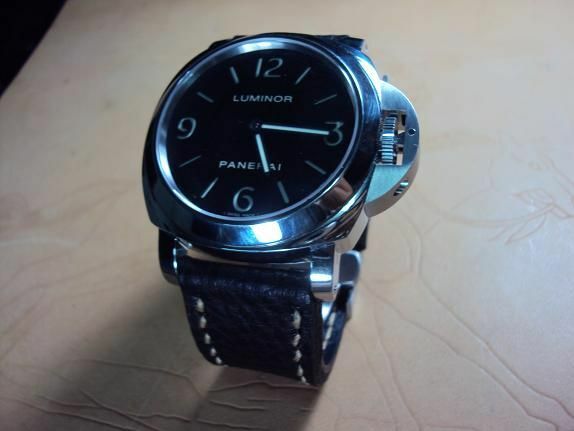 Porder101, panerai grayish blue big horn crocodile strap, 24x22mm, 75x125mm, cream stitching. The Panerai big horn croco strap is priced at $ 270 USD, now it charges the promotional price at $ 220 USD including registered airmail worldwide shipping. 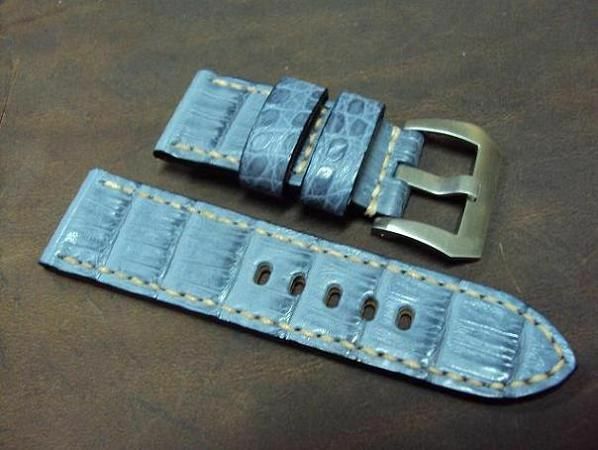 Porder102 24x22mm, 95x115mm, padded golden crocodile deployant strap, blue stitch. 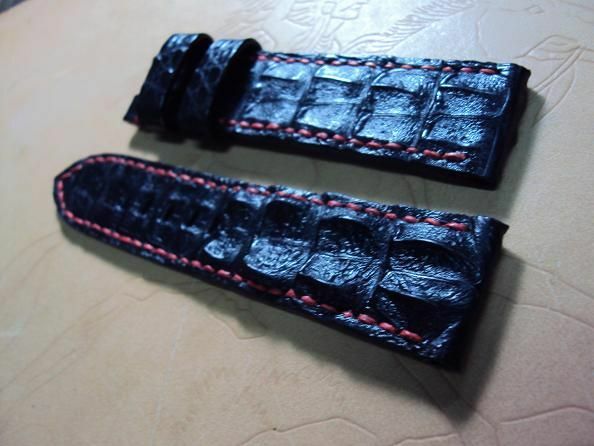 The padded crocodile strap is a particularly difficult hand made crocodile straps. We pare the British soft calf leather to be a leather board pad to produce the padded middle layer of the crocodile strap. After that, we glue together among the up side crocodile skin, the middle padded layer and the back side calf lining and sew these three pieces together. The heavy padding croco strap is priced at $ 200 USD, now charges the promotional price at $ 150 USD including registered airmail worldwide shipping. Porder103, Panerai big horn black crocodile deployant strap, 24x22mm, 95x115mm, red stitching. Porder104 Custom deployant strap, 24x22mm, 75x125mm, thick 4.0mm taper to 2.2mm, black grained leather watch strap, cream stitching. 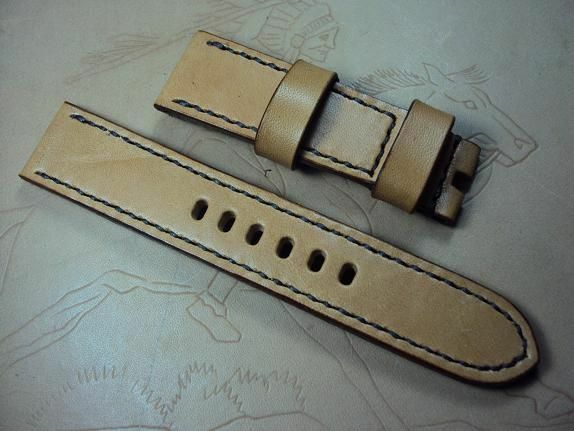 Porder105 24x24mm, 130x80mm, thick 4.0mm taper to 3.5mm, honey brown vintage leather strap, cream stitch. 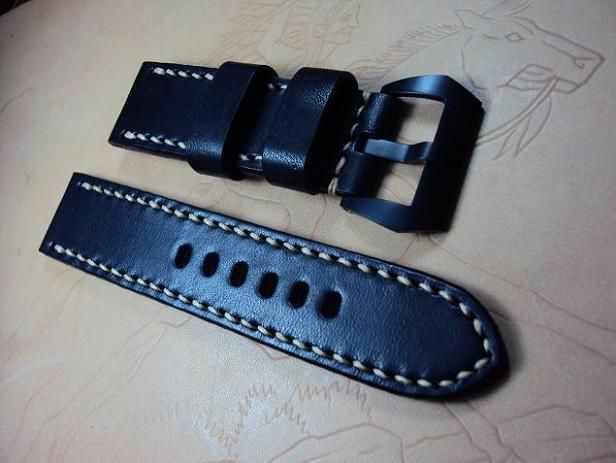 Porder106 24x24mm, 75x125mm, thick 4.0mm, ultrasoft black vintage leather watch strap, cream stitch. It's priced at $ 120 USD, now charges the promotional price at $ 70 USD including registered airmail worldwide shipping. No including the Pre-V 24mm PVD buckle, it's an optional item charges extra $ 30 USD. 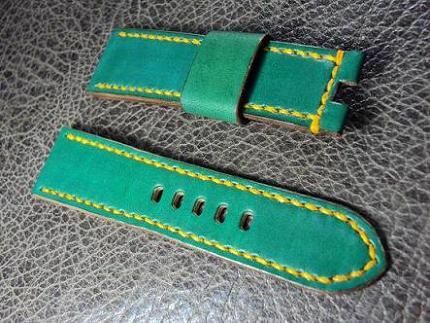 Porder107 26x22mm, 95x115mm, thick 5.0mm taper to 2.2mm, green leather deployant strap, one wide floating keeper, yellow stitch. 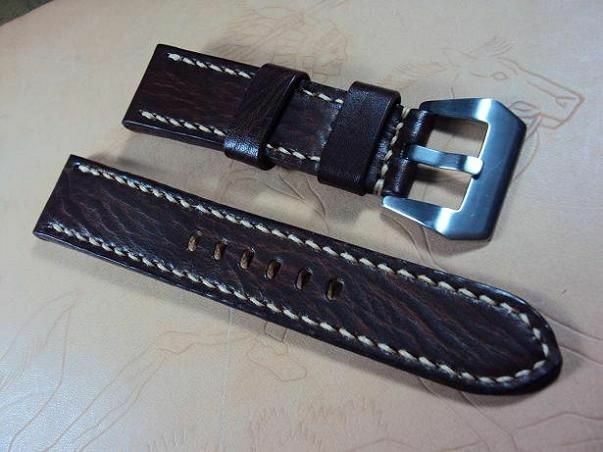 Porder108 24x22mm, 80x135mm, thick 5.0mm taper to 2.8mm, ultrasoft chocolate brown grained leather watch strap, cream stitch. 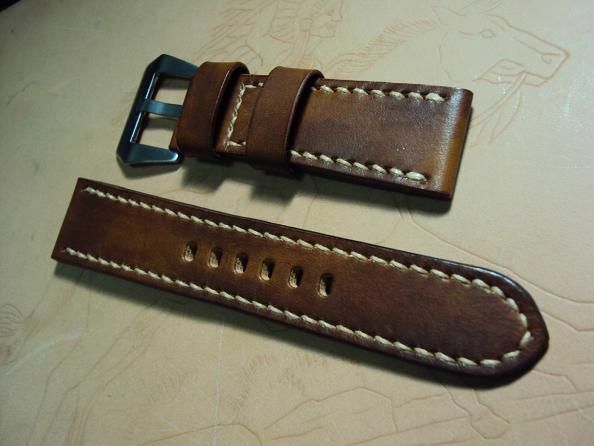 Porder109 24x22mm, 80x135mm, thick 4.0mm taper to 3.0mm, honey brown vintage leather watch strap, cream stitch. 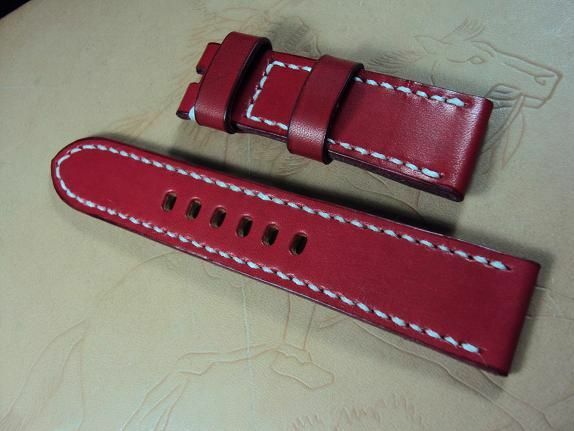 Porder110, 24x22mm, 75x130mm, thick 4.0mm taper to 3.5mm, red leather strap, white stitch. 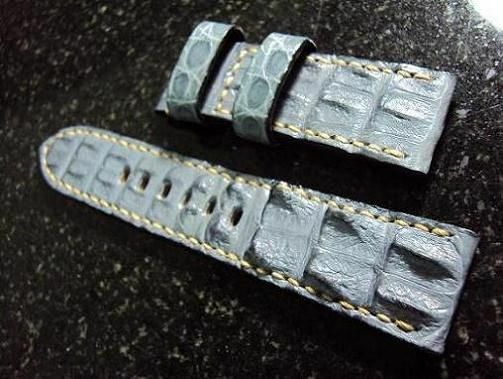 Porder112, 24x24mm, 75x140mm, thick 3.5mm, grayish blue crocodile belly strap, cream stitch. The croco belly strap is priced at $ 180 USD, now charges the promotional price at $ 130 USD including registered airmail worldwide shipping, or plus extra $15 USD for EMS shipping. 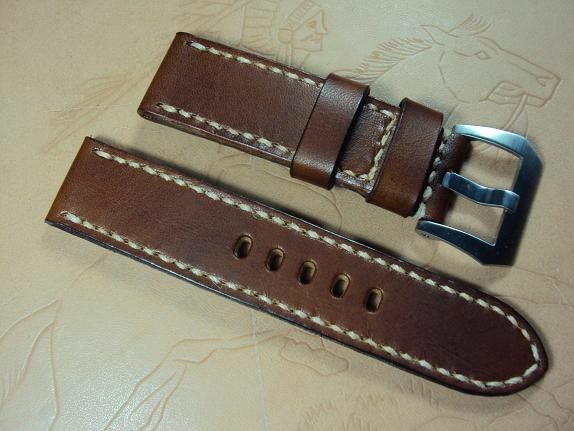 Porder113, 22x22mm, 75x115mm, thick 4.5mm taper to 3.5mm, chocolate brown vintage leather watch strap, cream stitch. 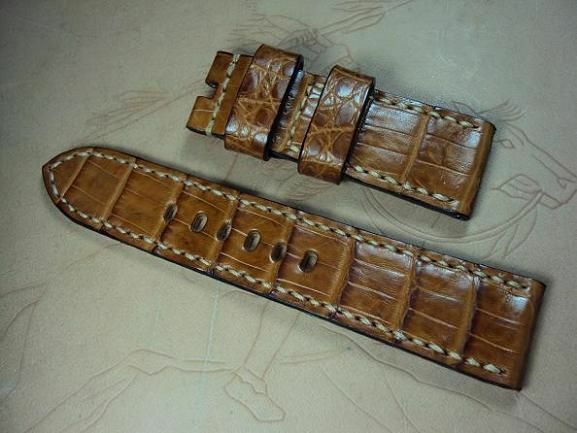 Porder114, 24x24mm, 75x130mm, thick 4.5mm taper to 3.5mm, dark brown croco belly strap, white stitch. The croco belly strap is priced at $ 180 USD, now charges the promotional price at $ 130 USD including registered airmail worldwide shipping,or plus $15 USD for EMS shipping. Porder116, 24x22mm, 55x105mm, thick 3.5mm, grayishblue crocodile belly strap, cream stitch. 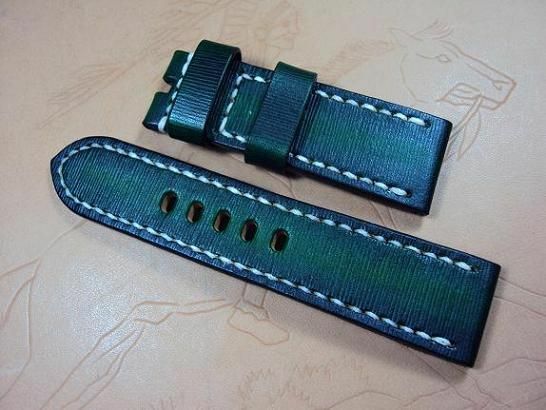 Porder118, 24x22mm, 75x115mm, thick 4.5mm taper to 4.0mm, strap, dark green ripple leather watch strap, white stitch. The ripple strap is price at $140 USD, now charges the promotional price at $ 80 USD including registered airmail worldwide shipping. Porder119 Panerai 352 custom strap, 24x24mm, 65x115mm, thick 4.0mm taper to 3.0mm, ultrasoft tan vintage leather strap, gream stitch. 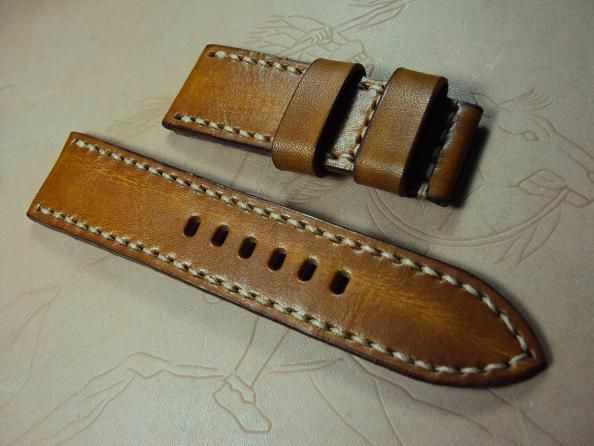 Porder121, 24x22mm, 85x135mm, thick 4.5mm taper to 3.0mm, tan vintage leather watch strap, sream stitching. 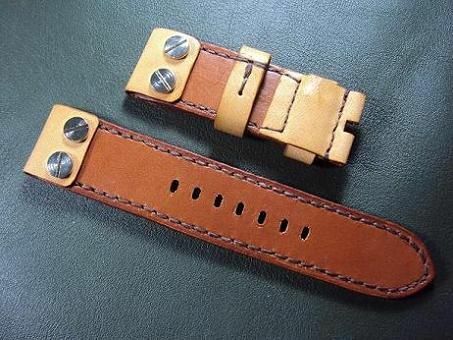 Porder123, 24x24mm, 75x115mm, thick 3.5mm, honey brown vintage leather strap, cream stitching. 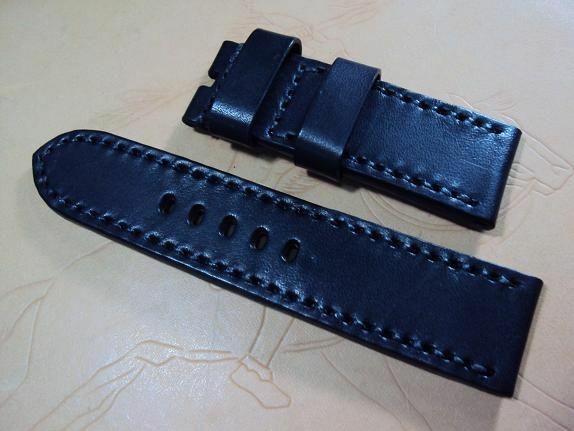 Porder124, 26x26mm, 80x130mm, thick 4.5mm taper to 4.0mm, ultrasoft black cowskin watch strap, black stitching. 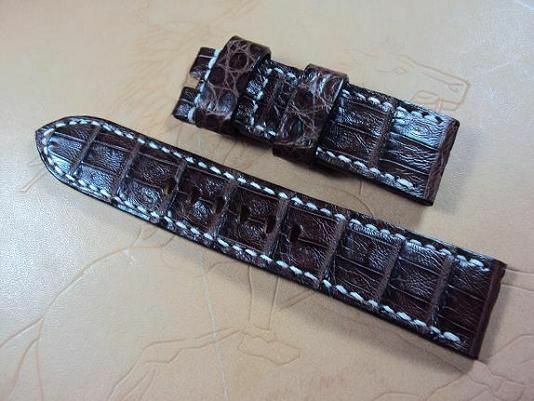 Porder125, 24x22mm, 70x125mm, thick 4.0mm taper to 3.5mm, chocolate brown croco belly strap, cream stitching.